There is no denying that SPEC CPU2006 was never one of our favorite benchmarks in the Professional IT section of AnandTech. Although it is the standard benchmark of most CPU designers and academic researchers, it is far from a real world benchmark for most professional IT users. For starters, a typical SPEC CPU2006 benchmark consists of running as many SPEC CPU2006 instances as there are cores available in the machine. The SPEC CPU2006 instances run completely independently from each other, so there are much fewer locks or other synchronization mechanisms at work: the benchmark scales almost perfectly as long as there is enough bandwidth available. Unfortunately, that is not how the majority of business software behaves: databases have high locking overhead and most applications need some synchronization. Secondly, most of the subtests are related to gaming and simulations (HPC). Typically these applications are much more processing intensive and achieve a higher IPC than your average business application. Lastly, the source code of the SPEC CPU2006 tests is compiled with extremely aggressively tuned compiler settings and compilers that are less used in the rest of the IT world. 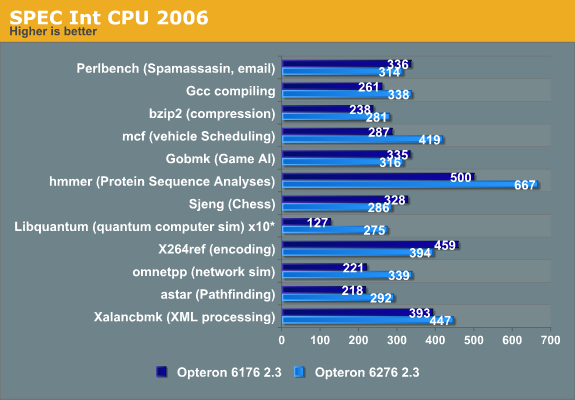 Few SPEC CPU2006 results are compiled with gcc and Microsoft's Visual Studio, for example. However, it would be a step too far to call SPEC CPU2006 useless. From a high level perspective, the scores of SPEC CPU2006 show a strong correlation with L2/L3 cache misses, cache latency, and to a lesser degree branch prediction, just like many business applications. Given similar platforms (like Intel Nehalem and AMD's Shanghai), the CPU SPEC2006 Int score gives a vague idea of which CPU has the most raw integer crunching power, although it overemphasizes memory bandwidth and core count. To understand the weaknesses and strengths of a certain CPU architecture, even in server workloads, there is no better test than SPEC CPU2006. The first reason is that it has been profiled by so many different people from academia to engineers. If we zoom in on the subtests we can derive a lot of information as we know exactly how these applications behave: there have been lots of performance characterization papers going into great detail. The second reason is that SPEC CPU2006 tests are compiled with the most optimal compilers and compiler options available at a certain point in time. This gives us some insight into the "real" (e.g. future) potential of a processor. We can exclude the possibility that a processor performs badly because some legacy piece of code is detrimental to the performance. If the CPU cannot score well with these kinds of binaries, it never will! The Xeon E5 is the most efficient clock for clock, core for core. But let us compare the Opteron 6276 (2.3GHz, 16-core Bulldozer) and the Opteron 6176 (2.3GHz, 12-core Magny-Cours) in the subtests. You can immediately derive from these numbers that the "Bulldozer" architecture has a very different architecture profile than Magny-Cours (which was based on the improved Barcelona architecture, Istanbul). Libquantum, omnetpp and mcf show larger performance boosts than you might expect from the 33% higher corecount. 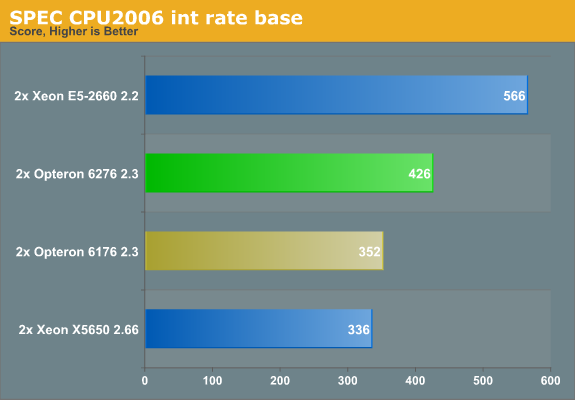 These benchmarks show that in some scenarios, Bulldozer can even increase the IPC compared to its predecessor. We also notice that Bulldozer has some serious weaknesses compared to its predecessor, as performance decreases in the Perlbench, the game AI (gobmk), the chess (Sjeng), and the x264 encoding subtests. And although it is not uncommon that a new architecture fails to beat the previous architecture in every benchmark, it is not a good sign that even a 33% core count cannot overcome the IPC decrease in a very good scaling benchmark. If we try to understand what makes these subtests different from the others, we can get an idea of what kind of software makes Bulldozer choke. This in turn can help us to understand if relatively small tweaks can help future Opterons. "There are also other factors at play, though, as it's already known that StarCraft II doesn't use more than two cores; theinstead, it's likely the..."